I just discovered an exclusive retirement community in South Florida called Palm Meow. What's so special about Palm Meow, you ask. Well, it's a retirement community FOR CATS, that's what. 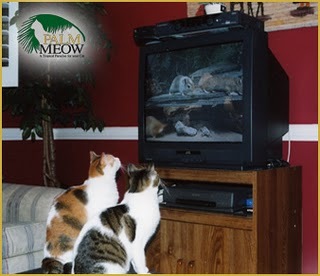 According to their website (which plays spunky calypso music that your cat will no doubt enjoy), Palm Meow's mission is to provide "high quality care for your cat in a tropical South Florida setting." First, I love that they describe it as being "exclusive", like it's a country club or something. Second, I know it's for cats, but I'd give anything for someone to brush my hair daily. I mean, how much do you love it when someone brushes your hair? Like when you're at the salon... it's so awesome. I wanna go to Palm Meow.